1. Requires MacOS Sierra 10.12.3 (or later) for using Thunderbolt connection on Mac. 2. Thunderbolt 3 reaches the maximum theoretical transfer rate of 40 Gigabits per second. Actual performance may vary due to hardware/software limitations and usage environment. 3. Thunderbolt 3 (40 Gbps) doubles its theoretical potential for speed when compared to Thunderbolt 2 (20 Gbps). This results in the TVS-1282T3’s file transfer speed increasing from 900 MB/s to 1,600 MB/s. 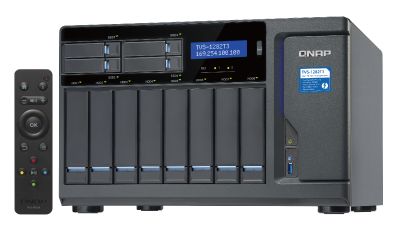 Download the QNAP TVS-1282T3 Series Datasheet (PDF).